Nolen's is the Venus Bridal gown store in the Bryan, College Station, TX area and also services Brenham, Austin and Waco, TX. The Venus Collection includes dresses from the Pallas Athena, Angel, Tradition, Venus Informals, Bella Bridesmaids, prom dress and flower girl dress lines. Venus Bridals, the very name evokes images of timeless beauty and the feeling of romance and the essence of glamour All of these things you'll find in a Venus Bridal gown. Venus, has created a vast array of styles, gathered into wonderfully diverse collections, each collection distinct from the others, so that the Bride may choose a gown which expresses her own individual beauty and unique personal charm. 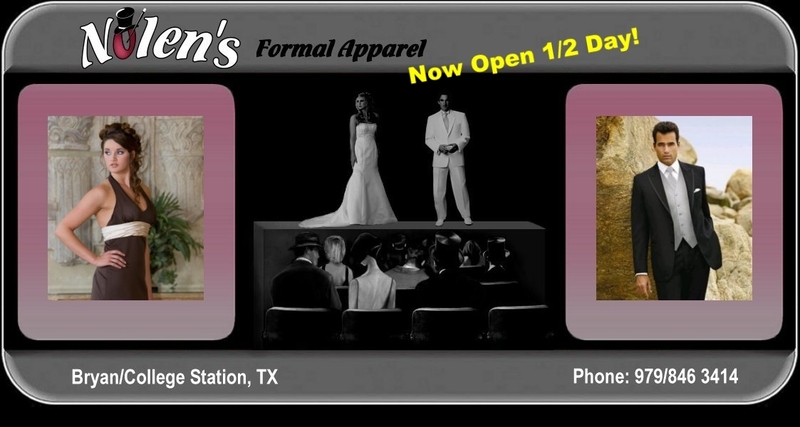 Nolen's Formal Apparel is a Venus Bridal dealer in Bryan, College Station. We also serve Houston, San Antonio, Brenham, Austin, Waco, TX and surrounding Brazos Valley in Central Texas. So if you are looking for a gown from Venus Collection, Pallas Athena, Angel and Tradition, Venus Woman, Venus Informals, Bella Bridesmaids or if you are looking for a prom dress or a flower girl dress, come to Nolen's.